See that teeny tiny strip of land there on the North Carolina coast, the Outer Banks, as they are more commonly known? And see that little red dot down there on Ocracoke Island? That's where we were. FYI - there is NOTHING there. They call Ocracoke Island the "Pearl of the Outer Banks". I'd have to say that's probably pretty accurate, because this place seems to have formed around a grain of sand. After all, that's what they seem to have plenty of. We wanted to drive the entire strip of the Outer Banks, starting in Kitty Hawk, down through Rodanthe (where we'd see the "Nights in Rodanthe" house), and ending at Hatteras to see the famous lighthouse before hopping on the ferry. But the ferry from Hatteras Island wasn't operating because of shoaling in the Hatteras Inlet, so instead of a 40-minute ferry ride from Hatteras Island to Ocracoke Island, we had to take a two-and-a-half-hour ferry ride from Swan Quarter. I'm sure it's perfectly beautiful in the summer time, when there's nothing to do but lay on the beach, but I can't imagine it being very pleasant crawling with hundreds of tourists. I just don't get the enjoyment in that. We often prefer to visit places in the off season to get a lay of the land and then go back when the weather is more suited to the location. 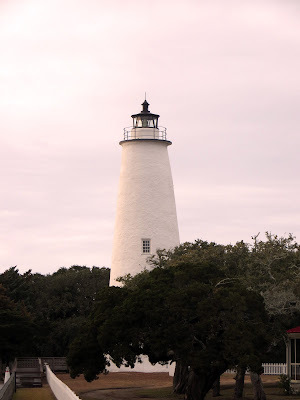 Of course we didn't really "choose" to go to Ocracoke Island, we just went because we had a load that delivered there, so this time of year there were only a few things open - the post office (which we didn't need), a variety/grocery/hardware store, a gas station, and a restaurant. So we ate lunch, drove to the end of the island, saw some of the famous ponies, took a picture of the ocean, swung by the lighthouse and then returned to our starting point to park and wait for the morning ferry. Very uneventful. It's one of those places I'd never go back to - like Key West - I've seen it now, I know what's there, and I have no reason to return. I might consider other areas on the Outer Banks for a day or two at the beach, but other than that, it's no longer on my list of places to visit. Seen one grain of sand from the Outer Banks, seem them all.